The history of the organs of Lancaster Priory may well go back to the time when it was a Benedictine Abbey, from 1094 to 1346. No evidence of an organ from this period has survived, and it is not until the Gerard Smith organ of 1729 that there is a clearer record of the organ. However, despite the survival of Smith’s contract many facts remain unclear, and Sumner explores how the result and what was contracted may have differed. A dispute over payment for this organ lasted over 34 years and never seems to have been resolved, leaving the impression that the organ was never satisfactorily completed. Satisfactory or not, the organ remained in use in its position on the west gallery until it was rebuilt by Thomas Hill in 1873 and moved to the east of the nave. It was housed in a new case by Paley and Austin. Once again the organ as delivered did not appear to live up to the promises of the contract. Its relocation to the east of the church had provoked considerable local opposition. Within the church the matter was dealt with by a committee that excluded the parish from discussions. This may not have been intentional, but it caused problems, provoked vocal local opposition and frustrated attempts at fundraising. No faculty was sought before work was commissioned – once again removing an opportunity for the parish voice to be heard. Some of the opposition to the scheme to move the organ to the east end was well informed. In 1871 The Revd Henry Greeves advocated that two organs were needed, one in the chancel, the other in the gallery. Electric action could be used to control both organs from one console in the chancel. This solution, rejected in 1871, was adopted in the 2012 organ. The relationship of the parish with its organ and the impact of changes in the use of the church is also illustrated. The impact was greatest in 1982 when the fully-working Harrison & Harrison organ gave way to an electronic instrument to allow provision of much-needed vestry space and a refectory. The organ, in common with many other church furnishings, is bound into the life of the parish. Good relationships in the parish and adequate consultation with well-informed advisers are vital to achieve a good outcome on every major project. The Willis-Harrison-Wells organ of 2012 has achieved a good outcome. It has all the resources needed for the rich musical tradition of this civic church with it’s strong choral tradition, and allows for the ongoing wider ministry of the church on a daily basis while not encroaching into the hospitality facilities. In 2012 Lancaster Priory became the proud possessor of one of the finest organs in northern England. Installed by David Wells Organ Builder of Liverpool, it restored to use two fine redundant instruments, now linked into one scheme played from a single detached console. 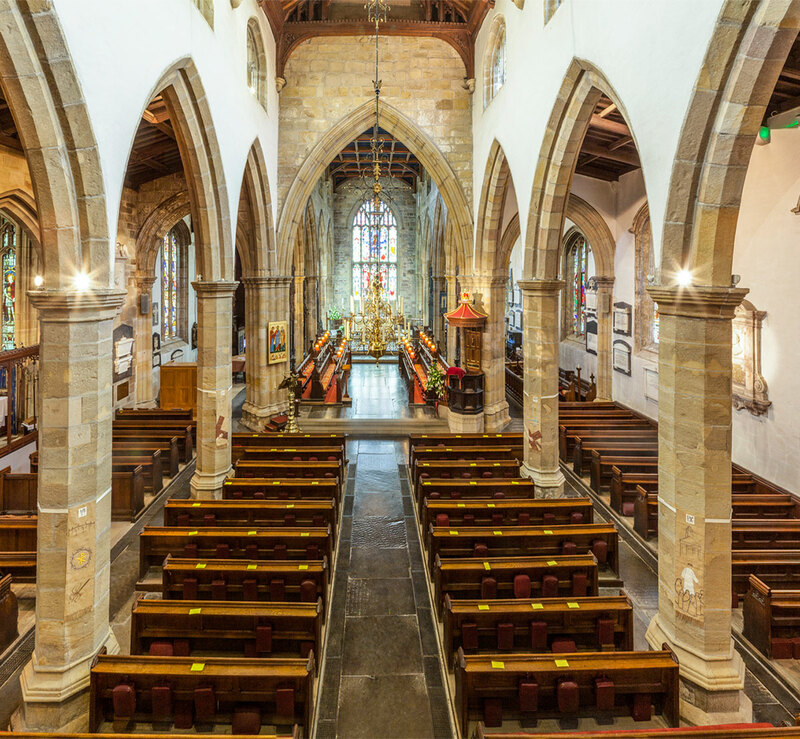 This was the culmination of many years of planning design and fund-raising by a committee led by Marion McClintock and the then vicar of Lancaster, the Rev. Peter Cavanagh. Funding contributors included the Pilling Trust, Centrica, and many individuals. The scheme was fina lly brought to fruition through the Heritage Lottery Fund. The organ in the west gallery was built originally by Henry Willis for St. John’s church Blackpool in 1915, while the organ in the North Choir Aisle was built by Harrison and Harrison in 1908 for Blackburn Girls’ School. The North Choir Aisle instrument is principally for accompanying the choir, while the gallery instrument is for leading the congregation and playing voluntaries and recitals. In practice, the organist uses stops from both instruments most of the time, playing the two divisions as one instrument. A special feature of the organ is the Duchy of Lancaster fanfare trumpet stop. This was made possible through funds from the Duchy of Lancaster. It is on higher pressure than the rest of the organ and has a particularly commanding sound, and may make you jump if you are not ready for it! Other fine features include of the instrument especially the reeds by Willis, and the flutes and diapasons by Harrison & Harrison. An excellent book outlining the history of organs at Lancaster Priory by Gerald Sumner (Lancaster Priory: A History of the Organs) is available from the church, priced £5.00. It gives a fascinating insight into the problems and personalities involved from the early 18th-century until the present day. There is also a CD of the organ played by Kevin Bowyer, also available from the church, priced £15.00.